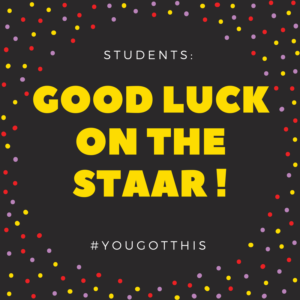 During April 10th through April 13th students will be STAAR Testing. Please make sure that your student gets a good night sleep, a good breakfast and comes ready to do their best on the test. We would like to remind you that visitors are not allowed on campus during testing days. Thank you for your cooperation and understanding. Important Safety Information for Parents STAAR T-Shirts Available!